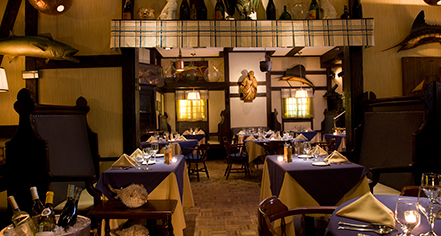 A highly-regarded seafood restaurant, the Cape Cod at The Drake Hotel has served award-winning seafood since 1933. Furnished with red-checked tablecloths, stuffed sailfish on the wall, copper pots, exposed beams, and weather vanes, the restaurant's vintage decor has also garnered recognition. Consistently named one of America’s finest dining spots, Cape Cod has served many great diners that have left their mark. Today, visitors may see the iconic initials of Marilyn Monroe and Joe DiMaggio carved into the world famous wooden bar. 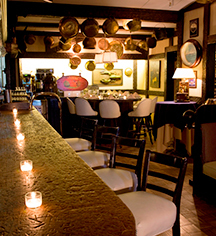 This cozy, well-proportioned restaurant also features a small oyster bar, serving East and West Coast varieties. Every Friday from 5:00 PM to 7:00 PM, Cape Cod offers $3 oysters with a selection of 3 mignonette, sherry, champagne, and red wine. Add a brulee of hollandaise and a selection of smoked trout roe or wasabi for $1.50. Book a dinner of 20 or more and the hotel will present your party with a paddle for signatures. After the dinner, the paddle will be displayed in the lounge area where the signatures will become a part of The Drake Hotel's history. The Cape Cod cares about the health of the oceans and has proudly partnered with the Shedd Aquarium to support sustainable seafood serving as a conservation leader in Chicago and the world.